Fresh N’ Clean®’s exclusive “multi-clean” system breaks down and helps remove pesticides and fertilizer residues from fresh fruits, raw vegetables, meat and fish. 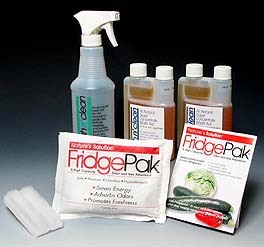 Fresh N’ Clean® Starter Kit – A great way to get started removing pesticides and other contaminants from your fruits and vegetables. Fresh N’ Clean® is concentrated and mixed at a rate of 1/2 ounce per pint of water. The Starter Kit includes: 2- 8oz concentrate bottles Fresh N’ Clean® 1- 16oz spray bottle for easy application 1- scrub brush for removing tough waxes and residues 1 Fridge Pak to help remove refrigerator gasses and odors. Almost all fresh fruits and raw vegetables sold in the marketplace contain toxic pesticide and heavy metal residues, unhealthy fertilizer residues, food waxes and just plain dirt. Some of the fruits and vegetables that are imported also contain pesticide residues from pesticides that are banned in the United States. Millions of pounds of contaminated fruits and vegetables are shipped each year. The FDA only inspects approximately 1% of those shipments and virtually EVERY piece of contaminated produce reaches the American public. Also, without a court order, the FDA has no authority to hold fruit or vegetable shipments while tests are made for contamination. This means that by the time the testing is done the produce has been consumed. There are over 600 pesticides in use today many of which are known carcinogens, neurotoxins, endocrine disrupters and reproductive toxins. To make matters worse, up to 25 different pesticides can be found on a large variety of fruits and vegetables which compound the problem greatly. Children are especially at risk because all of the FDA tolerance data is based on adults and doesn’t take into consideration the rapid cell growth that occurs in children. These pesticides accumulate in the fatty tissues and exercise their toxic effects over time causing long term problems with cancer, nervous system impairment, infertility, memory loss, estrogen imbalance in women and other subtle but long term effects. The exclusive Fresh N’ Clean® formula breaks down and encapsulates pesticides so that the do not re-deposit on your produce. Extensive laboratory tests have shown that the exclusive, all natural Fresh N’ Clean® formula removes up to 600% more contaminants than plain water! You need a more efficient removal system then plain water to remove pesticides, heavy metal deposits and fertilizers from your fruits and vegetables….after all, all pesticide chemicals are formulated not to wash off in the rain. Fresh N’ Clean®’s exclusive “multi-clean” system breaks down and helps remove pesticides and fertilizer residues.